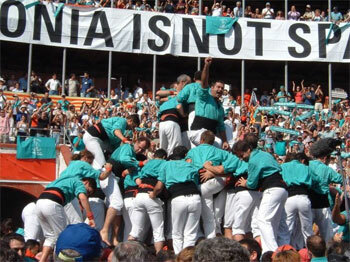 Castellers de Villafranca will travel on June 19 to New York, where they plan to do a performance on June 23 to promote human towers as UNESCO World Heritage. This will be the first time a human tower is raised in Manhattan, where they will stay until June 25. Their journey coincides with the projection of the 3D film Enxaneta, produced by Televisió de Catalunya and directed by Paulí Sobirà. The Greens (‘els Verds‘ as they are known) will also attend the premiere of ‘The Human Tower’, directed by Ram Davineni and Rojas Canos. The expedition is composed by 126 people. The documentary ‘The Human Tower’, which has already won 19 awards, reflects the philosophy and the passion with which the castellers teach Castellers de Lo Prado and their participation in the festival Dahi Handi in Mumbai. After their 2008 trip to Chili in and India, this visit to New York represents another opportunity to promote Catalonia and human towers around the world.